What’s wrong is that it states that self-sacrifice is love. 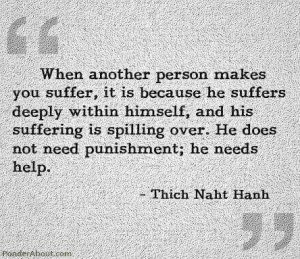 While there is a part-truth in that the person attacking you may be hurt and suffering, that’s no reason to allow them to control and manipulate you. There is no need to punish them, only to stand your ground and make it clear that you do not accept their abuse and will not tolerate it. Open a dialogue and help them help themselves. If they deny and don’t want to discuss it, let them go. If you allow this, then it is YOU that needs help. Here is another version of the same problem. 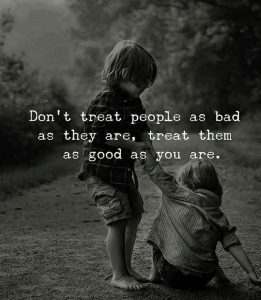 Where someone is treating you badly, but you have this denied superiority judgment on what you believe is love; that just because they are treating you badly, YOU will not stoop to their level and do what you consider to be bad to them. It’s the unseen role of denial and judgments that keeps you in the endless cycle if abuse. 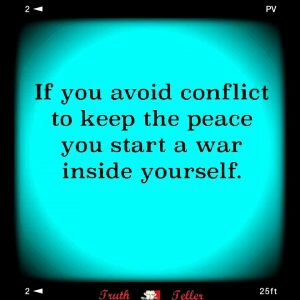 This entry was posted in Anger - Rage, Denial, Feelings - Emotions, Health & Wellness, Imprint-programs-beliefs, Love - Conditional, Love - Unconditional, New Age, Self-Empowerment, Society - Culture and tagged denial, self-sacrifice by johnrieger. Bookmark the permalink. My mistake seems to be in wanting to punish those who attack me and try to control me. Even when I feel that I handled a confrontation well and stood up for myself, the bullying will eventually continue and I start to lose hope and my denied rage will also build up. Most of the abuse I encounter occurs in the workplace and it is difficult for me to deal with these confrontations without acting out and losing my job. Thanks for posting. The bullying only continues if you have not made it clear that you don’t accept it. Yes, they will try another tactic to see if you really meant what you said. If you express your real anger and rage in the moment when they are attacking you, (and mean it) they will get the message. It’s only when you deny expressing your real anger and rage in the moment, that your rage becomes denied, suppressed, and then later, you ACT it out to punish and get revenge, and that can lead to unpleasant experiences. Confronting your abusers is a tough decision, but one that you will eventually have to make as this abuse is not going to go away magically. Part of the issue is also a fear of physical conflict and that you will get the worst of it. I assure you that it doesn’t have to get that far if you have the courage to speak your truth when they are attacking you, but like I said, it has to be real. If you give a willy-nilly response to their abuse, that just feeds their attack. Your REAL anger and rage are there to PROTECT you, not to attack another, unless of course, you are being attacked physically, and then, there are no rules..